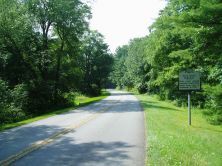 First rural national parkway. Construction began near here on September 11, 1935. The Blue Ridge Parkway, part of the National Park Service system, extends 469 miles through the Southern Appalachians, linking the Shenandoah National Park in northern Virginia with the Great Smoky Mountains National Park in North Carolina and Tennessee. Designed for leisurely travel, the road is free of commercial development. From the outset attention has been given to preserving the natural beauty of the area and providing the traveler with uncluttered vistas. A similar highway was proposed in 1912 by Joseph Hyde Pratt, head of the North Carolina Geological and Economic Survey. In August of that year he reported to the North Carolina Good Roads Association that he and his men had been surveying a route, which he called the “Crest of the Blue Ridge Highway.” Their plans were abandoned during World War I; however, the present road follows part of Pratt’s original projected route. 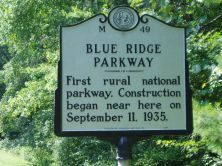 No one person can be credited with the idea for the Blue Ridge Parkway. Virginia Senator Harry Byrd claimed credit as did others. The claim with the most basis was that of Theodore E. Straus, adviser to Maryland Senator George Radcliffe and a member of the Public Works Administration. The Parkway, which was also one of Representative Robert Doughton’s chief interests, was authorized in 1933. The following year Interior Secretary Harold Ickes chose the final route, one that passed through western North Carolina, over one that would have gone through eastern Tennessee. His decision came after intensive lobbying by politicians and private interests from both states. Contracts were awarded in August, 1935 and, on September 11, work began on a section extending southward from the North Carolina-Virginia line. Workers were secured from the unemployment rolls of Alleghany County as provided for in the Parkway legislation’s relief provisions. In 1985 ceremonies marking the fiftieth anniversary of the Parkway drew 7,500 people to Cumberland Knob. The final section of the highway, including the Linn Cove Viaduct, was completed around Grandfather Mountain in 1987.